Another year has gone by and I’ve finished another bridal show. I’ve been doing bridal shows off and on (mainly on) for the past 8 years. Over the past 5 years, I’ve mainly been focusing on the Event Nation Bridal Expo. There are others in Fayetteville, but I like this one the best. I already talked about why brides should go to a bridal show, so today, I’m going to share my experience at the 2019 Event Nation Bridal Expo. Not all bridal shows are the same. They can actually be quite different. It really depends on the location, what they offer, and the people running it. My normal setup. This was from a few years ago. For the longest time, this show has been in Rogers at the John Q. Hammons center, but this year it was at the Fayetteville Town Center. There are positive and negative things about each. John Q. Hammons is extremely large, has lots of parking, and good lighting, but it is in Rogers and the loading area isn’t covered. There have been several times it rained, and we had to run through it. The Town Center has a parking garage, so we didn’t have to worry about the weather. The only issue with that was that there was a long wait at the elevators. Another big, big plus is that the Town Center let us set up on the day before the show, and John Q. didn’t. The one small issue I had with this show was the lighting. For some reason it was really dark, so you couldn’t really see my booth or my photos. They had to keep the blinds down on the windows so some booths wouldn’t get blinded, but I didn’t really understand why they couldn’t turn on more lights. Next time, I’ll just bring my own lights. The Event Nation Bridal Expo does offer some nice extras. They do a grand prize giveaway to draw in a crowd, and any vendor could add something to it. It’s a good way to get your name in front of everyone. They also allow you to put info in the bags for a small fee. The most useful extra is they give you contact information for the couples before the show (those that pre-register) and those that show up. The last thing that makes this show work is the people. I’ve had a really good experience with the people that run it. They are always visible and extremely helpful. Other shows don’t have enough workers or aren’t quick to respond and help. 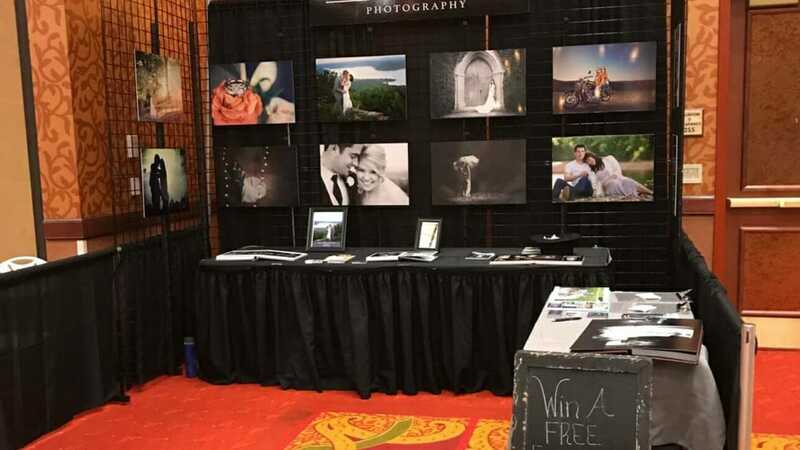 The numbers seemed a bit down this year at the 2019 Event Nation Bridal Expo, but that might have been due to the snow. Still, I had several good conversations, and as long as I book one couple, I’m happy. It’s only been a few days, so hopefully I’ll hear from a few brides in the next couple of days. Anyway, I enjoy this show, and it has been helpful in the past. I plan on attending more in the future.